Proc Natl Acad Sci U S A. 2010 Jul 13;107(28):12493-8. Epub 2010 Jun 30. Olson LJ, Peterson FC, Castonguay A, Bohnsack RN, Kudo M, Gotschall RR, Canfield WM, Volkman BF, Dahms NM. Mannose 6-phosphate (Man-6-P)-dependent trafficking is vital for normal development. 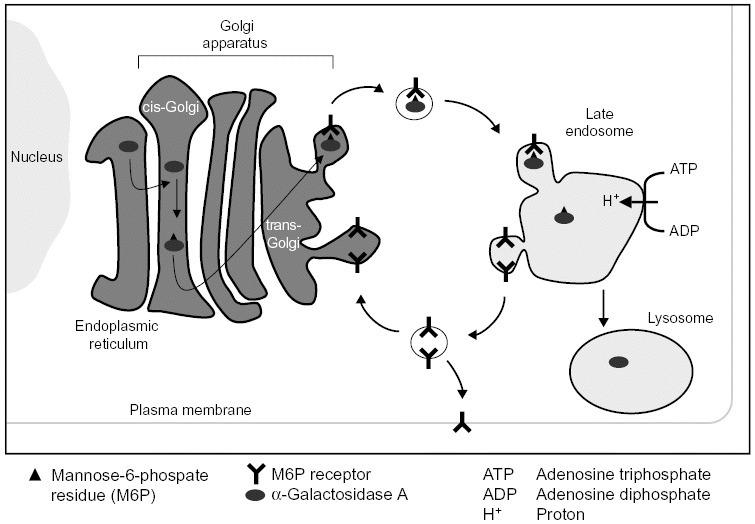 The biogenesis of lysosomes, a major cellular site of protein, carbohydrate, and lipid catabolism, depends on the 300-kDa cation-independent Man-6-P receptor (CI-MPR) that transports newly synthesized acid hydrolases from the Golgi. The CI-MPR recognizes lysosomal enzymes bearing the Man-6-P modification, which arises by the addition of GlcNAc-1-phosphate to mannose residues and subsequent removal of GlcNAc by the uncovering enzyme (UCE). The CI-MPR also recognizes lysosomal enzymes that elude UCE maturation and instead display the Man-P-GlcNAc phosphodiester. This ability of the CI-MPR to target phosphodiester-containing enzymes ensures lysosomal delivery when UCE activity is deficient. The extracellular region of the CI-MPR is comprised of 15 repetitive domains and contains three distinct Man-6-P binding sites located in domains 3, 5, and 9, with only domain 5 exhibiting a marked preference for phosphodiester-containing lysosomal enzymes. To determine how the CI-MPR recognizes phosphodiesters, the structure of domain 5 was determined by NMR spectroscopy. Although domain 5 contains only three of the four disulfide bonds found in the other seven domains whose structures have been determined to date, it adopts the same fold consisting of a flattened beta-barrel. Structure determination of domain 5 bound to N-acetylglucosaminyl 6-phosphomethylmannoside, along with mutagenesis studies, revealed the residues involved in diester recognition, including Y679. These results show the mechanism by which the CI-MPR recognizes Man-P-GlcNAc-containing ligands and provides new avenues to investigate the role of phosphodiester-containing lysosomal enzymes in the biogenesis of lysosomes.